All the components involved in the refrigeration cycle are fitted inside the refrigeration units, thus creating lots of advantages. Plug in refrigeration equipment has all the components involved in refrigeration cycle, including compressor, condenser, thermoregulation valve and evaporator, fitted inside the refrigeration system, thus creating lots of advantages. 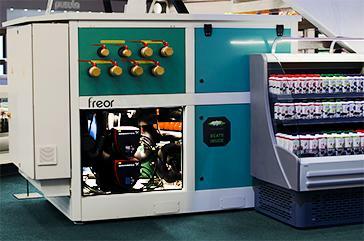 Plug & Play is fitted with effective hermetic compressors excellently operating in various temperatures. They require significantly less refrigerant and its leakage percent is minimum, thus making the system maintenance cost-effective. The need for special refrigeration room and long copper pipelines is eliminated, thus guaranteeing cheaper system installation in the store and ensuring easy care. It is a simple and cost-effective system that allows to save up to 70% installation expenses if compared with non-autonomous equipment. Flexibility is another important advantage. System can be easily relocated. Possibility to discharge excess heat via water pipes – see Hydroloop solution. Hermetic system and freon leakage close to zero allow to minimise the negative impact on the environment and global warming. 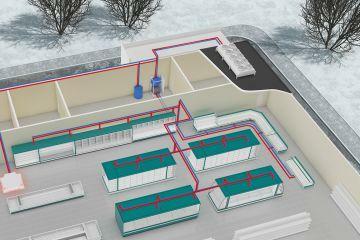 Fully hermetic refrigeration system with a small quantity of refrigerant (up to 80% less refrigerant). Double air-curtain prevents energy loss. Environmentally-friendly solution, minimum leakage of refrigerant (0–4%). Equipment can be easily relocated in the shop. Equipment can be joined to make the rows, new equipment can be added at any time. No need for additional refrigerant for the system. No need for special refrigeration room. Less shop area is needed. Easy replacement of components or piece of equipment without stopping the whole system. 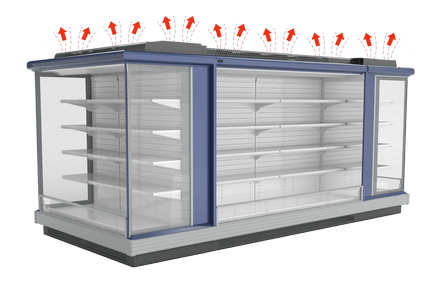 Quicker and cheaper installation in the shop – all refrigeration components are factory integrated. No need for welding on site. Convenient repairs and component replacement – easy access to all components of the refrigeration equipment. Every refrigerator operates as a separate unit, therefore failure in one piece of equipment does not affect the others, and potential loss of products is minimised. Double sound isolation of the compressor and its mounting at the back of the refrigerator minimise noise level. Double air-curtain keeps cold inside the refrigerator and prevents it from entering the shop area. It promotes sales – no cold sensation emitted from the refrigerator allows buyers to spend more time near the product shelves. High quality of Freor products is based on our experts’ knowledge and use of high-quality components. Components are purchased exclusively from the world-leading manufacturers. Shop air-conditioning is needed to eliminate heat during the hot seasons. Interested in more energy efficient solutions? Learn more about the Hydroloop solution offered by Freor. Hydroloop system is a cost-effective solution for shops, which allows connecting the plug-in refrigeration equipment to liquid-cooled system, in which excess condensation heat is removed through liquid pipes to the exterior of a building. F-gas widely used in the commercial refrigeration equipment strongly contributes to the global warming. 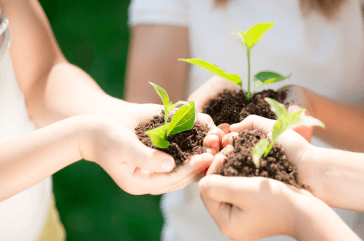 FREOR Green Wave product line is an alternative that ensures ecological refrigeration by using exclusively environmentally-friendly refrigerants. While the cooling and freezing equipment extract the heat from the interior of the units in order to cool down the products, the multi-functional heat pump takes the emitted heat and transforms it into heating energy.